Nathaniel is an ‘Expert Myofascial Release Therapist’ in the John F. Barnes type of Myofascial Release. This has involved significant training, study, and practice within the John F. Barnes Myofascial Release methodology. Nathaniel is certified in medical massage techniques and has been a Licensed Massage and Bodywork Therapist in the state of North Carolina since May of 2003. 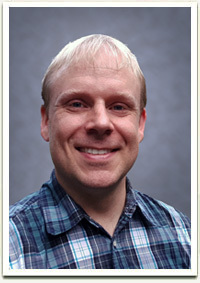 Prior to working in Myofascial Release, Nathaniel received a Bachelor of Science in Computer Science from Duke University in 1999. At Duke, Nathaniel also followed a pre-medical course of study. His medical interest originally stemmed from having had scoliosis correction surgery in 1993. It was during his time at Duke that he explored what it meant to be a doctor and felt that going to medical school and becoming a doctor would not lead to a career or life that would be a satisfying fit for him. It was also during this time that Nathaniel was first introduced to massage and bodywork therapy. After graduation from Duke Nathaniel spent four years in Atlanta working as a software engineer. While in Atlanta Nathaniel came to understand more about his future goals and trained as a massage therapist at the Atlanta School of Massage®. Nathaniel received a Bachelor of Science in Computer Science from Duke University in 1999. He graduated from the Integrative Massage and Deep Tissue Program of the Atlanta School of Massage in 2002. He received medical massage certification from a NCBTMB recognized program taught by Ralph Stephens at Body Therapy Institute.